It’s terribly sad. For a team like Samoa that has gone through a rebuilding phase for the past few years and have just started to find its feet back in the big time again, it’s tough enough to have to front up to the big guns. But when you have a bunch of players giving there absolute all for their country, playing their hearts out only to be denied an opportunity unfairly, it just breaks your heart. Not that it’s anything new when it comes to teams from this part of the world who are trying to make it to the big time. We’ve seen it time and time again over the years. We saw it during the glory days of our Manu Samoa Sevens when they were building up to their first and only world title. And we are seeing it again. People can be forgiven for thinking it’s a conspiracy. The exception to the trend of course – and we believe this is something Samoa should aspire to become – is to be the best and better than all the rest, like Fiji. Regardless of how many times bad calls have gone against the Fijians, they seem to have a way of bouncing back, shutting their minds to them and doing the business. Which is precisely what they’ve proven again in Hong Kong this year. On top of the fact they are exceptionally great players, they proved a class above everybody else so that no matter what the officials did, there was no denying them what was rightfully theirs; the Hong Sevens title for the fifth time. What an achievement. Which is something we can all learn from. And certainly for the Manu Samoa, they should make it a goal. The worry is that these sorts of bad calls could easily discourage players, break their spirits and reduce their dreams to nothing but a thousand pieces. Who wants to continue to play when you are up against your opponent plus the officials? The end result for the Manu Samoa Sevens from the three-day Hong Kong Sevens last weekend feels a bit like that. We are talking about how the team was robbed of a place in the final. Indeed, it wasn’t just one bad call but several poor calls that went against the men in blue. These clearly denied them the opportunity. But the one that had the knock out impact was the try that should never have been given to France. How the referee, his assistants and the TMO failed to see that the French player was out is the stuff of nightmares. Any little kid could’ve made the call. All those millions of people who saw it on TV knew. And yet the referee just calmly awarded it without a care in the world. To call it daylight robbery is an understatement. The question is; who holds these guys accountable for their actions? They are so quick to blow the whistle on player infringements and the like, but who blows the whistle on them? The performance by these officials in relation to this particular instance was disgraceful. They all deserve a red card. It’s a poor reflection on World Rugby and the World Sevens Series. Would they have still given it if the roles were reversed with Samoa being the try scorer? Who knows? Getting back to the point, to be the best, Samoa must learn from Fiji’s example. They are the champions because they let nothing stand in their way – including all those dubious calls against them. No one can match Fiji at their best. That’s what Samoa should aspire to do. Which is not easy and it’s not going to happen overnight. We are talking about a goal that’s going to take years to achieve. The good news is that during the past few months, we’ve seen this Manu Samoa Sevens really starting to develop into quite a force. It’s taken a while but we are seeing tremendous improvements and we can only they will get better. Our people are starting to talk about names like Johhny Vaili, Tofatu Solia, Melani Matavao, David Afamasaga and a few of the players as household names. Which is wonderful. This is bringing back great memories thinking of players like Pesamino, Alafoti Faosiliva and all the other household names that made up that dream team. 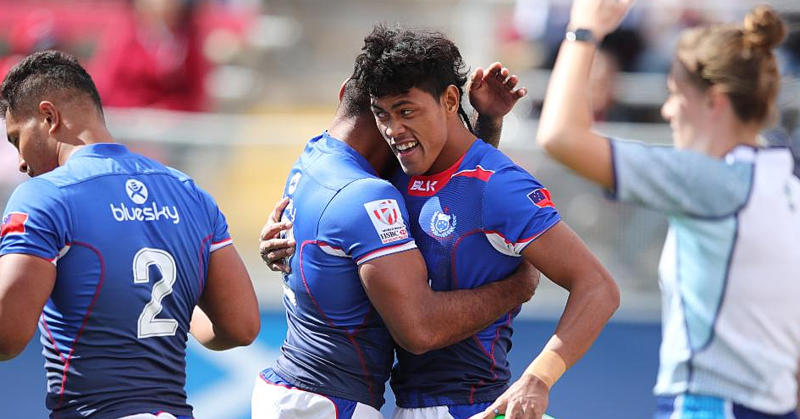 From what we saw in Hong Kong during the weekend, this Manu Samoa Sevens team is on the cusp of something pretty special. You can sense it. And with their eyes firmly set on 4th place and Olympic qualification with three more tournaments to go, there is nothing stopping them from achieving the impossible. It’s not going to be easy but it’s doable if they are in the right frame of mind. What they need to do though is forget about what happened in Hong Kong last weekend and focus on what’s next. In Singapore this weekend, they have to front up to New Zealand, Japan and Spain in their pool, which should be their ultimate focus. Anything is possible if they make the Cup playoffs again. When we look at the teams that are constantly in the Cup playoffs of the World Sevens Series, there is not much difference between them at all. All it takes is one mistake and a bad call for one team to drop and another to advance. And often it comes down to the little things like poor execution, missed tackles; a drop ball and aggression applied the wrong way. For Sir Gordon Tietjens, captain Afamasaga and the Manu Samoa Sevens, they have their work cut out. We wish them well as they look to continue the momentum in Singapore and the remainder of HSBC World Sevens Series. Have a fabulous Tuesday Samoa, God bless!